How does the inherent design of neural connections imply vulnerability to the effect of chemical drugs? How does your body effect an appropriate response to a stimulus? To what extent can memory, identity, and learning be explained in terms of physical neurology? 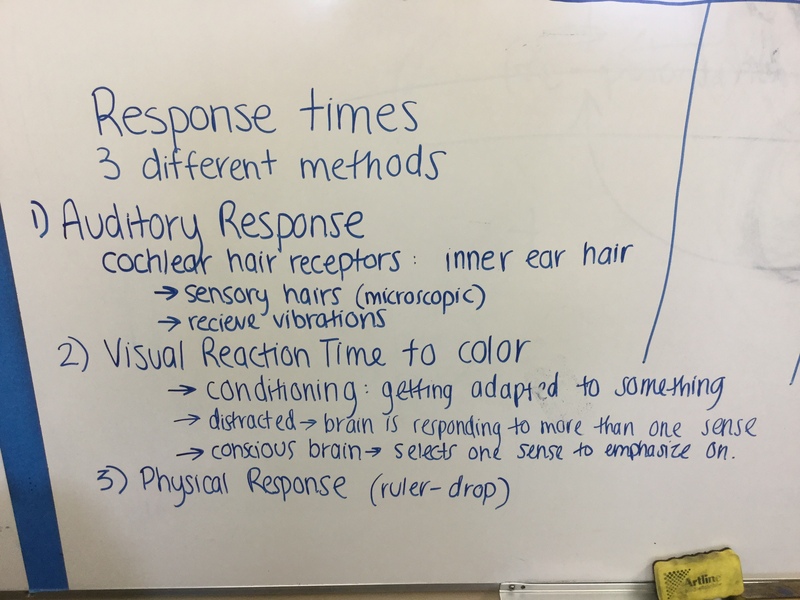 Objectives: today we are going to learn what a nerve impulse is, how it travels through the body, and how it helps you to formulate a response. Stimulus. Anything that is detected by the body and triggers a response eg. a loud sound. Stimulus-Response pathway. The way that a nerve impulse travels through the body when a stimulus – response combination occurs. Nerve impulse. An electrical signal, which travels along an axon. Neuron. A nerve cell. The axon is the elongated part of the cell, which carries the nerve impulse. Myelin sheath: The insulation which surrounds the axon, made from special cells called Schwann cells wrapped around the sheath. 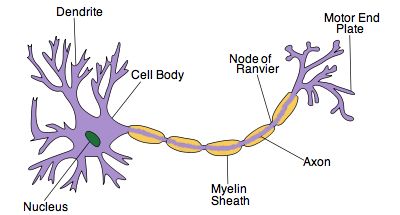 Nodes of ranvier: Gaps where there is no myelin. Introduction: Watch this video on electrocution. Be ready to formulate a response to this question, what does electricity do to our bodies? How is this related to the nervous system? Information travels through the nervous system in the form of nerve impulses. A nerve impulse is an electrical signal that travels along an axon. Nerve impulses travel through neurons, or nerve cells. Neurons have elongated nerve fibres called axons, which are insulated with a fatty tissue, and may stretch for example – from your toes to your spinal cord. Shorter nerve fibres called dendrites, transmit nerve impulses from near by eg. in your brain or spinal cord. 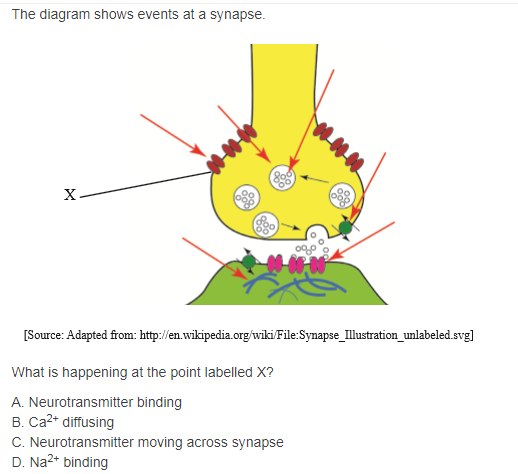 Synapses represent the junctions between neurons. 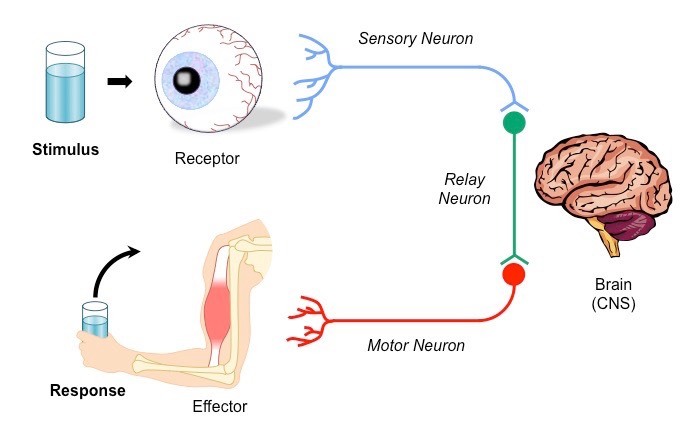 For a typical stimulus – response pathway, nerve impulses have to pass through three neurons. This means that two synapses are involved. Illustration: in the image below, showing what happens if you prick your hand on a pin (stimulus) and withdraw it (response). 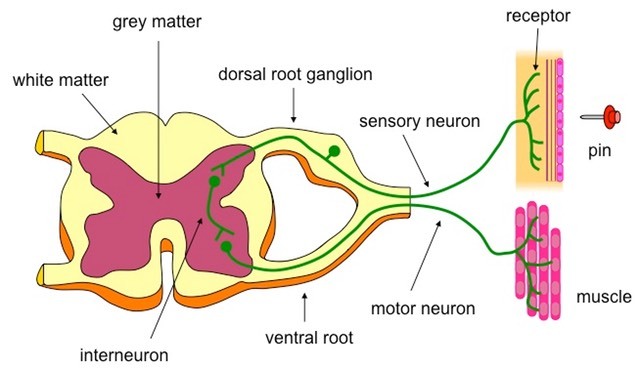 Note the gaps between neurons, these are synapses. 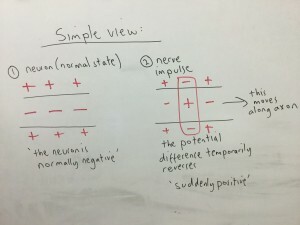 Nerve impulse transmission – how does it work? this provides a potential difference (-70mV) where the inside of the axon is negative compared to the outside. Step two (and three): Excitation. A nerve impulse is generated. 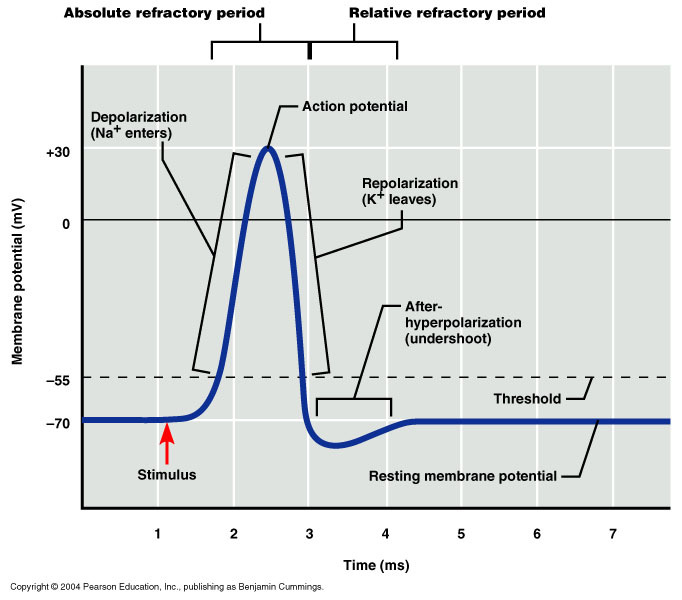 This is called the action potential, and the nerve impulse is generated – called depolarization, and then the membrane recovers – this called repolarization. Gated sodium channels open, allowing Na+ to flood across the membrane, causing a temporary positive charge. 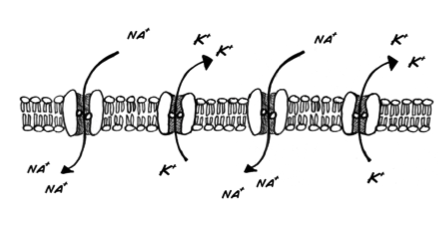 Gated sodium channels close, and potassium channels open, allowing K+ to flow out across the membrane, restoring the negative charge. For a moment the negative charge is more than normal (hyperpolarization). The sodium/potassium pump restores the normal balance of ions. In order for this to occur, a certain voltage must be generated by the sodium, called the ‘threshold potential’. Discussion: how does the axon achieve a resting potential? 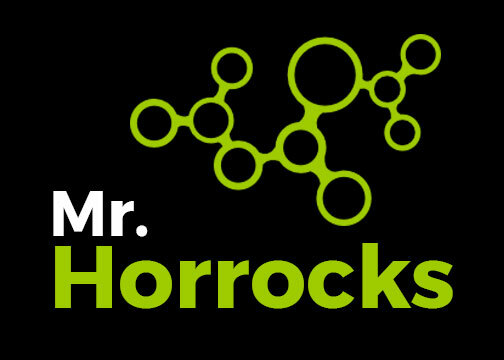 Objectives: Link synapses to memory, learning, and poison! A nerve impulse crosses a synapse with the aid of a neurotransmitter eg. acetyl choline. That is a chemical agent that carries a signal across a synapse. The neurotransmitter is broken down and removed. Overview: these pesticides kill insects by blocking the neurotransmitter acetyl choline. This paralyses and effectually kills insects, but not mammals. Some people think they are harming natural honeybee populations. Acetyl Choline is a neurotransmitter which transmits information between motor neurones and muscles. A higher percentage of synapses are cholinergic in insects (contain acetyl choline). 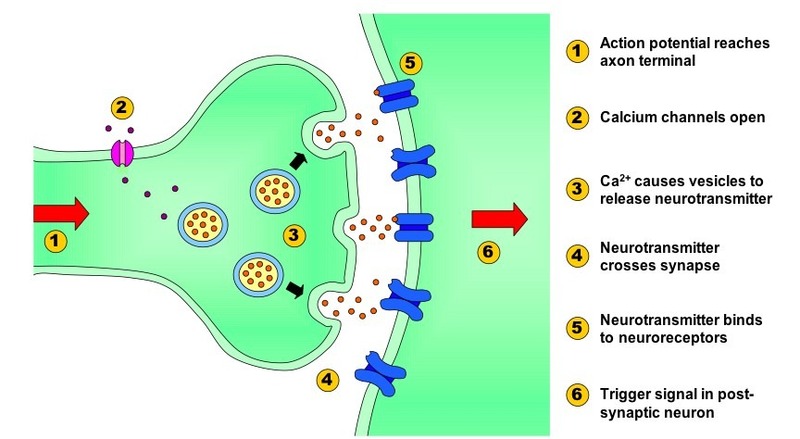 For acetyl choline to transmit an impulse across a synapse, it has to bond to the post-synaptic membrane receptor. It binds for a short time, and then breaks down into choline and acetate because of an enzyme called acetycholineesterase. Neonicotinoid pesticided bind permanently to the acetyl choline receptor on the post-synaptic membrane. This blocks the binding of acetyl choline, and effectively blocks the transmission. The result is paralysis and death for insects. Mammals are less affected as less synapses are cholinergic. A worry of using neonicotinoids pesticides is that they will also kill useful insects, like wild honeybee populations. Q2) Explain the effects of cocaine in terms of its action at synapses in the brain and its social consequences.